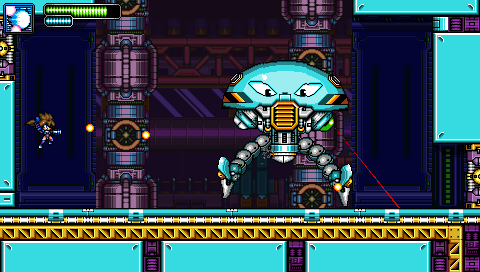 Metagal, from RetroRevolution, is an action platformer heavily inspired by the Mega Man series. You take on the role of Meta (a.k.a. GAL.00) as she faces off against her cyborg sisters who have been turned against her by the nefarious General Creeper. Meta must fight her way through four lengthy stages before reaching her sisters, each of which has a different special ability. Following the tradition of Mega Man, Meta is able to copy her sisters' abilities once they are defeated (although they aren't weak to any specific weapon). The first four stages may be completed in any order, after which, a final set of linear fortress levels unlocks, putting the player's skills and special abilities to the test. The game is quite challenging, and it's a bit rough around the edges with some cheap deaths and bosses that are less difficult than the levels leading up to them, but it offers a fairly solid Mega Man-style retro experience. The game is currently available for PC via Steam. Check our coverage here.